A sump pump is a small pump installed in the lowest part of a basement or crawlspace. Its job is to help keep the area under the building dry and to prevent it from flood­ing. Usually, sump pumps are installed in specially constructed sump pits. Water flows into the sump pit through drains or by natural water migration through the soil. The sump pump’s job is to pump the water out of the pit and away from the building so the basement or crawlspace stays dry. According to the American Society of Home Inspectors, more than 60 percent of American homes suffer from below-ground wetness. But even more, homeowners are likely to have to deal with a flooded basement at some point. It doesn’t take much water to cause thousands of dollars of damage. A moist basement can also lead to mold and mildew growth, bringing with it all its related health and breathing hazards. Sump pumps have been a common fixture in some homes for years, primarily in low-lying areas or places where r­apid melting of heavy snow can lead to flooded basements. However, legislation, including amendments to the U.S. Federal Clean Water Act in 1987, has made sump pumps a requirement in homes that aren’t necessarily at a high risk for flooding. 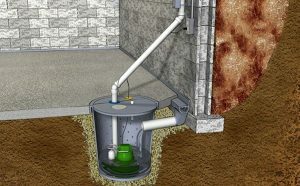 Today, sump pumps are common in new construction homes. A sump pump usually stands in a sump pit — a hole with a gravel base about 2 feet (60 centimeters) deep and 18 inches (45 centimeters) wide — dug in the lowest part of your basement or crawlspace. As the pit fills with water, the pump turns on. It moves the liquid out of the pit through pipes that run away from your home to a spot where the water can drain away from your foundation. The pipe usually has a one-way valve called a check valve at the pump end to keep the water from flowing back into the pit. Most sump pumps turn on automatically through a float activator arm or a pressure sensor. The pressure sensor works just like its name suggests: Water exerts more pressure on the sensor than air does, which causes the pump to activate. The float activator works a lot like the one in your toilet tank. A buoyant ball floats on top of the water, manually moving the arm as the water level rises. You can also buy a manually operated pump, which works only when you decide to turn it on, but these aren’t as common because of their lack of convenience. Automatic pumps also have an option for you to activate the pump if the float arm or sensor should fail to work. The typical home sump pump uses a centrifugal pump to move water. When the motor is on, it causes a screw- or fanlike device called an impeller to turn. Using the centrifugal force, the spinning impeller forces water toward the sides of the pipe, creating a low-pressure area at its center. Water from the pit rushes to fill the void, and the impeller’s spinning action pushes it out through the pipe. Sump pumps for home use are powered by electricity and use standard household current, so they don’t require specialized wiring beyond a grounded outlet. Since the pump is always in or near water, it’s a good idea to have a ground fault circuit interrupter on the outlet to prevent accidental electrocution. There are two primary sump pump designs, both of which are about 2 1/2 to 3 feet (76.2 to 91 centimeters) high. A submersible pump rests in the water. It’s encased in a waterproof housing, with the pump itself at the bottom and the outlet pipe near the top. A flat-screen or grate covers the bottom of the pump to keep out debris. When the pump turns on, water is sucked up through the grate and routed into the pipes and out of your home. The other common type of sump pump is the pedestal pump. Pedestal pumps look something like a long stick with a fat head. The pedestal keeps the pump out of the pit, away from the water even when the pit is full. An inlet pipe reaches down into the bottom of the pit to draw the water out. Since the motor and pump are out of the water, pedestal pumps are usually louder — but less expensive — than submersible pumps. Depending on the laws in your area, you may not need a sump pump. For example, if you’ve never had standing water in your basement and it’s consistently warm and dry, a sump pump probably wouldn’t do you much good. However, if the area under your house floods occasionally or feels damp and smells musty, there’s a good chance y­ou have an issue with moisture entry. Along with other waterproofing steps, a sump pump would make your basement a healthier space and protect any possessions and appliances you store there. One way you can check whether moisture is getting into your home through your basement floor or walls is by taping a 2-foot-square (61-centimeter-square) piece of plastic onto the surface and leaving it in place for a day or two. If you’re not sure where the moisture may be coming in, it’s a good idea to do this in multiple spots. After a couple of days, check under the plastic — if it’s wet, you have a moisture problem. The first step in dealing with basement moisture is to air it out and run a dehumidifier. Since most moisture that ends up in a basement comes from water draining around your foundation, check to see that your gutters and downspouts are in good repair and directing water at least 6 feet (1.8 meters) away from your foundation. In a couple of weeks, repeat your plastic sheet test — if it shows moisture, a sump pump may be a good idea. Horsepower: Sump pumps are commonly one-quarter to one-third horsepower. More powerful motors will pump more water, but you don’t need to go overboard if your moisture problem is minor. Cord length: You n­eed to be able to plug a sump pump directly into a ground fault circuit interrupter outlet — you shouldn’t plug one into an extension cord. You can have a professional install a sump pump in your home, but if you’re a reasonably handy person, it may be a job you can take on yourself. 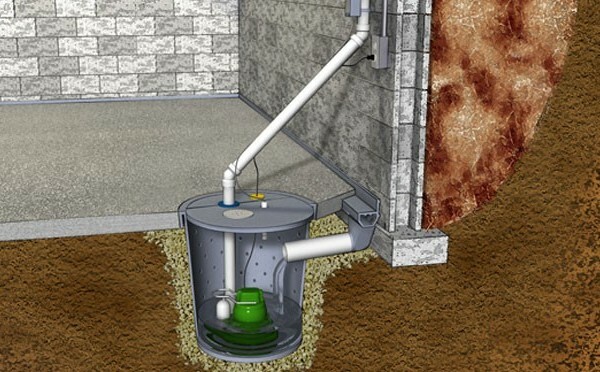 Here’s an overview of how to install a sump pit and pump in your basement. Determine where water, sewer, and utility lines enter your home. You want to put your sump pit away from this ­ existing infrastructure at the lowest point of your basement (you can use a laser level to determine this point). The pump should be at least 8 inches (20 centimeters) away from an outside wall and close to a ground fault circuit interrupter outlet. Figure out how you are going to route the outlet pipe — usually 1 1/2 inch to 2 inch (3.8 to 5 centimeter) PVC. Running it up through a rim joist is usually the easiest way to get the pipe to the outside. Purchase your sump pump and liner together. The liner, essentially a heavy plastic tub with slits to allow water to enter, will determine the size of the hole you dig. You want to dig the hole at least 3 inches (7.6 centimeters) wider than the liner and about 6 inches (15.2 centimeters) deeper. You can use the liner as a starting template and enlarge your outline by 3 inches (7.6 centimeters). Dig the hole to the depth recommended by the sump pump manufacturer, then level the bottom. The easiest way to cut through the concrete is to use a jackhammer. Put the liner into the hole and fill around the outside with coarse gravel. Also put about 6 inches (15 centimeters) of gravel in the bottom of the pit. Tamp it down firmly to ensure the bottom stays level. Attach the discharge pipe to the pump, and place the pump into the pit, making sure it stands upright and level. Cut a piece of PVC drain pipe 1 foot (30.5 centimeters) long. Drill a hole in the rim joist to accommodate the discharge pipe and install it in the hole. Measure and cut pieces of PVC pipe to run from the pump to the inside of the pipe through the rim header. Dry fit all the pieces, and when you’re sure they are right, cement them together. On the outside, fit a piece of discharge pipe onto the pipe protruding through the rim header. Run it to the discharge area, then cement the pipe in place. The discharge pipe shoul­d have a small vent hole that’s out of the water but drains into the pit. This vent hole is designed to prevent an air lock from forming in the lower part of the pump. Finish up by caulking around the hole in the rim header both inside and outside and supporting the discharge pipe inside the house by attaching it to walls or joists. Finally, adjust the float valve on the pump following the manufacturer’s directions. Check the operation by pouring in two or three buckets of water, then plug in the pump. Most sump pumps are equipped with water level or flood alarms, usually, battery powered, that alert you if the pump isn’t working properly and water is backing up. More sophisticated systems can notify your alarm company or call your cell phone if the water starts to rise. Fortunately, this shouldn’t happen often. Sump pumps, on the whole, are quite reliable. But as with any other important piece of equipment, regular maintenance is always a good idea. Spend a few minutes every couple of months, when heavy rains are forecast and in early spring to ensure reliable sump pump operation. Basic sump pump maintenance is usually as simple as doing these few jobs. Make sure the pump is plugged into a working ground fault circuit interrupter outlet and the cord is in good shape. In damp areas, GFCI ­breakers may trip, effectively shutting off the sump pump. Check in on your sump pump periodically so you can reset the GFCI if necessary. Ensure the pump itself is standing upright. Vibrations during operation can cause it to fall or tilt onto one side. This can jam the float arm so it can’t activate the pump. Periodically pour a bucket of water into the pit to make sure the pump starts automatically and the water drains quickly once the pump is on. If the pump doesn’t start, have it serviced. Another important point is the sump pump’s power supply. The fact that sump pumps rely on electricity to operate does make them vulnerable in the event of a power outage. Fortunately, there are backup options available. For some people, at least those on municipal water systems — and assuming the city water system is still functional — water-powered sump pumps that don’t need any electricity are an option. These pumps literally use the pressure of flowing water to pump water out of the sump. The downside to this design is that the pumping process uses virtually the same amount of city water as the quantity of water it pumps out. So, while water-powered pumps aren’t necessarily a good choice for a main pump, they offer a viable option for a short duration backup pump. Sump pumps with backup battery power are also commonly available. The backup power comes from a car battery — or even better, a deep cycle boat battery. Most of the systems charge the batteries while the power is on, ensuring the battery is fully charged in the event of a power outage. Alternatively, a trickle charger used for car batteries is also an option. Some homeowners use backup gasoline or diesel generators to provide their own electricity in the event of a power outage. Since a small sump pump needs 800 to 100 watts to operate and can draw up to 1,800 watts when starting, a backup generator needs to be sized properly and, of course, well maintained.